Beautiful map of the French Riviera. Gouvernement General du Dauphine, divise par Bailliages. 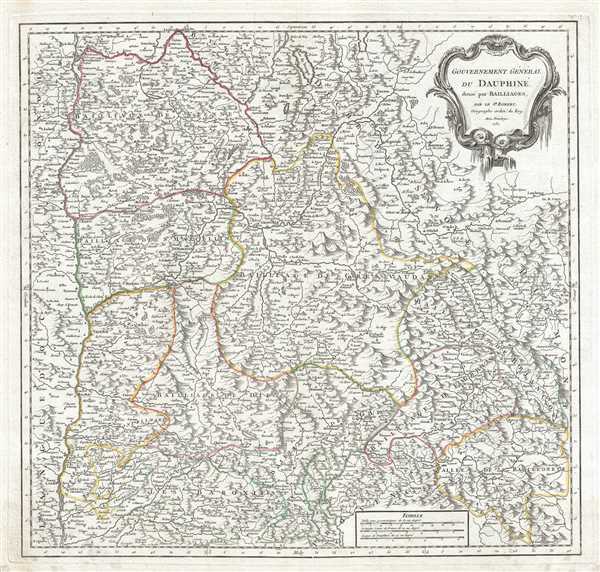 This is a fine 1751 map of the Dauphine region of France by Robert de Vaugondy. It covers the southeastern region of France from Rossilon south to Guillaumes and from Privas east as far as Susa, Italy. The map includes the whole or parts of the departments of Drome, Isere, Savoie and hautes-Alpes and renders the entire region in extraordinary detail offering both topographical and political information with forests and mountains beautifully rendered in profile. This region, known as the playground of Europe's elite, is admired for its stunning natural beauty, distinctive culture, superb cuisine, delightful beaches, and fantastic wines. Isere is known for its production of Bleu du Vercors-Sassenage, a mild cow's milk blue cheese, and Saint-Marcellin, a softer cheese, while Drome s famous for its production of Picodon, a spicy goats-milk cheese. The Hautes Alpes area of France is known for its production of Coteaux and Collines Rhodaniennes wines, and is also famous for its chestnuts. The map includes a beautifully engraved title cartouche in the top left quadrant. This map was drawn by Robert de Vaugondy in 1751 and published in the 1757 issue of his Atlas Universal. Rumsey 3353.046. Pedley, Mary Sponberg Belle et Utile: The Work of the Robert de Vaugondy Family of Mapmakers, 159.